For the past six years, volunteers from St. Patrick parish in Edina have been collecting prepared, perishable food donations from local restaurants and delivering them to Sharing and Caring Hands in Minneapolis. 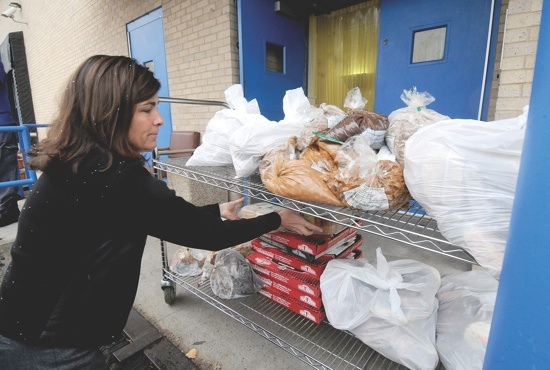 On a recent morning, Susie Van Hoomissen backed up to the loading dock at Sharing and Caring Hands to unload the bags and boxes of frozen food — from restaurants like Chipotle, Papa John’s, Caribou and Starbucks — that filled the back of her car. For the past two years, Van Hoomissen has been part of the network of volunteer drivers from St. Patrick that pick up and drop off the donations. The ministry is a way the working mom of two teenagers can give back to the community, Van Hoomissen said. “It’s flexible and I can make my own hours,” she said. Workers at each restaurant pack up the leftover food to donate and store it in the freezer. Then a volunteer from St. Patrick picks it up and puts it in a large freezer at the church. Twice a week, a volunteer delivers the food to Sharing and Caring Hands. The parish works with Harvest Support Center, a national organization that works with non-profits to find or develop resources to support their efforts to offer the hungry prepared, perishable food. It’s hard to imagine that people are going hungry, and yet so much food is being thrown away, Schnorbach said. This ministry feeds hungry people, reduces food waste and provides tax benefits for the companies that donate. The parish has created a system and has worked to put best practices in place. They could help other interested parishes get started, Schnorbach said.